Providing you the best range of preset counters, programmable digital timer, programmable digital timers, cycle timers, cycle timer and programmable timer with effective & timely delivery. RCT401 is a Preset Counter that counts events, batches, measures frequency, motor-speed, cable-length, acts as a zero-speed switch to detect stoppage of a rotating shaft and more. The counter receives input from proximity switches, photoelectric switches, voltage pulses, limit switches, micro switches and electromagnetic pickups amongst others. It can count up, count down, bidirectionally as well as in quadrature. The counter measures frequency up to 5000 Hz. RCT401 features 2 user-programmable electromagnetic relays for process control as well as retransmits an isolated output signal to other devices such as a Solid-State Relay (SSR) or Programmable Logic Controller (PLC). 2 additional LEDs indicate the status of each of the 2 relays. Operators view and change up to 2 set points on the display via the membrane keys on the front of the unit. 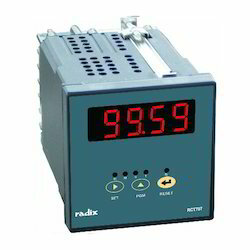 The counter counts a range of 0 to 999999 with absolute accuracy and measures 0.06 - 9999 RPM within 0.05% of the reading. RCT401 provides mutual signal isolation of 1 kV AC RMS/1 minute for its own power supply, the input & output. RCT601 is a multifunction programmable timer with non-volatile memory to automatically operate a time-based process, counting upwards or downwards. It retains memory of elapsed time until the next time it is switched on. The timer features a wide range of configurable control inputs. Start simply turns on the timer and there are 3 variations each for the Stop, Reset and Gate control input functions. The Stop function can stop the timer and maintain relay status, turn the relay on or turn it off. Similarly, Gate will freeze the timer in presence of an input and maintain relay status, turn the relay on or turn it off. Reset maintains the timer at its initial state as long as input is present, the timer will start counting up or down when the input is removed. In Pulse reset mode, it will reset and immediately restart the timer. In the third Reset variation, it will reset the timer and wait for a start pulse to begin counting again. RCT701, a multifunction programmable timer to automatically operate a time-based process, counting upwards or downwards. The timer features a wide range of configurable control inputs. Start simply turns on the timer and there are 3 variations each for the Stop, Reset and Gate control input functions. The Stop function can stop the timer and maintain relay status, turn the relay on or turn it off. Similarly, Gate will freeze the timer in presence of an input and maintain relay status, turn the relay on or turn it off. Reset maintains the timer at its initial state as long as input is present, the timer will start counting up or down when the input is removed. In Pulse reset mode, it will reset and immediately restart the timer. In the third Reset variation, it will reset the timer and wait for a start pulse to begin counting again. A single LED displays the time counted up or down, 5 additional LEDs indicate hours, minutes, seconds, timer status and relay status. Operators can program 1 set point via membrane keys on the front of the unit. It is accurate to 0.01% of a quartz crystal.RCT701 features one relay with 4 relay functions: ON-DELAY, OFF-DELAY, CYCLIC-1 and CYCLIC-2. RCT605 is a multifunction programmable timer with non-volatile memory to automatically operate a time-based process, counting upwards or downwards. Similarly, Gate will freeze the timer in presence of an input and maintain relay status, turn the relay on or turn it off. Reset maintains the timer at its initial state as long as input is present, the timer will start counting up or down when the input is removed. In the third Reset variation, it will reset the timer and wait for a start pulse to begin counting again. A dual LED displays the set time and elapsed time, 6 additional LEDs indicate hours, minutes, seconds, timer status and the status of each of the 2 relays. 2 setpoints are programmed by the operator via membrane keys on the front of the unit. It is accurate to 0.01% of a quartz crystal. RCT605 features 2 relays with 4 relay functions: ON-DELAY, OFF-DELAY, CYCLIC-1 and CYCLIC-2. RCT608 is a Cyclic Timer with Cycle Counter with non-volatile memory to automatically operate a time-based process, counting upwards or downwards. Not only does it count time to switch a process on or off, it also maintains a count of the on/off cycles it has been through. RCT608 retains memory of elapsed time until the next time it is switched on. The timer features a wide range of configurable control inputs. Start simply turns on the timer and there are 3 variations each for the Reset, Stop and Gate control input functions.The Stop function can stop the timer and maintain relay status, turn the relay on or turn it off. Similarly, Gate will freeze the timer in presence of an input and maintain relay status, turn the relay on or turn it off. Reset maintains the timer at its initial state as long as input is present, the timer will start counting up or down when the input is removed. In Pulse reset mode, it will reset and immediately restart the timer. In the third Reset variation, it will reset the timer & wait for a start pulse to begin counting again. RCT602 is a Multi function Programmable Memory Timer with non-volatile memory to automatically operate a time-based process, counting upwards or downwards. In Pulse reset mode, it will reset and immediately restart the timer. In the third Reset variation, it will reset the timer and wait for a start pulse to begin counting again. A dual LED shows the set time and elapsed time, 6 additional LEDs indicate hours, minutes, seconds, timer status and the status of each of the 2 relays. Operators can program up to 2 set points via membrane keys on the front of the unit. It is accurate to 0.01% of a quartz crystal. RCT602 features 2 relay with 4 relay functions: ON-DELAY, OFF-DELAY, CYCLIC-1 and CYCLIC-2. RCT703 is a multifunction programmable timer to automatically operate a time-based process, counting upwards or downwards. It has volatile memory and will not store information without a power supply. RCT703 features a push wheel switch for frequent set point changes. 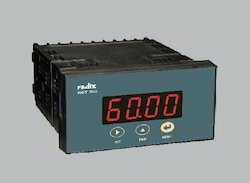 The timer features a wide range of configurable control inputs. 0.1 seconds to 990 hours. ± 0.01% quartz crystal accuracy. 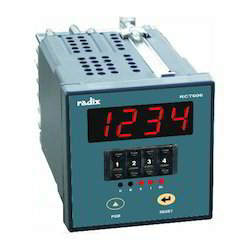 RCT702 is a multi function programmable timer to automatically operate a time-based process, counting downwards or upwards. RCT 702 features a dual LED display shows the set time and elapsed time while 6 additional LED s indicate hours, minutes, seconds, timer status and relay status. Operators can program up to 2 set points via membrane keys on the front of the unit. It is accurate to 0.01% of a quartz crystal. RCT 702 features two relays with 4 relay functions: ON-DELAY, OFF-DELAY, CYCLIC-1 and CYCLIC-2. Multifunction Programmable Memory Timer, starts simply turns on the timer and there are 3 variations each for the Gate, Reset and Stop control input functions. A single LED display shows the time counted up or down, 5 additional LEDs indicate hours, minutes, seconds, timer status and relay status. Operators can program 1 set point via membrane keys on the front of the unit. RCT606 is a multifunction programmable timer with non-volatile memory to automatically operate a time-based process, counting upwards or downwards. It retains memory of elapsed time until the next time it is switched on. RCT606 features a push wheel switch for frequent set point changes.The timer features a wide range of configurable control inputs. Start simply turns on the timer and there are 3 variations each for the Gate, Reset and Stop control input functions. Start simply turns on the timer and there are 3 variations each for the Gate, Reset and Stop control input functions.The Stop function can stop the timer & maintain relay status, turn the relay on or turn it off. Similarly, Gate will freeze the timer in presence of an input and maintain relay status, turn the relay on or turn it off. Reset maintains the timer at its initial state as long as input is present, the timer will start counting up or down when the input is removed. In Pulse reset mode, it will reset and immediately restart the timer. In the third Reset variation, it will reset the timer and wait for a start pulse to begin counting again. A single LED displays the time counted up or down, 5 additional LEDs indicate hours, minutes, seconds, timer status and relay status. 1 set point can be programmed by the operator via a push wheel on the front of the unit. It is accurate to 0.01% of a quartz crystal. RCT606 features one relay with 4 relay functions: ON-DELAY, OFF-DELAY, CYCLIC-1 and CYCLIC-2. 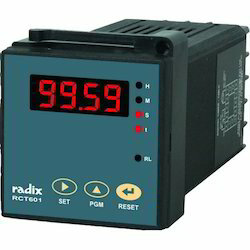 RCT206 is a programmable RPM indicator typically used to measure motor and shaft speeds up to 5000 Hz. 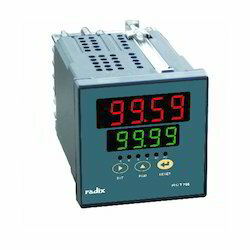 RCT206 features a dual 6-digit programmable LED display, which indicates the measured process value & set point. Operators can program up to 2 set points and 2 alarms via membrane keys in the front of the unit. For even greater accuracy, RCT206 can be programmed to take in multiple pulse-inputs over 1 rotation and display the correct value via a scaling calculation. The rate-indicator transmits 2 relay outputs as well as 1 isolated retransmission 4-20 mA output for process control or to a PLC/DCS. RCT707 is a multifunction programmable timer to automatically operate a time-based process, counting upwards or downwards.It has volatile memory and will not store information without a power supply. The timer features a wide range of configurable control inputs.Start simply turns on the timer and there are 3 variations each for the Stop, Reset and Gate control input functions. The Stop function can stop the timer and maintain relay status, turn the relay on or turn it off. Similarly, Gate will freeze the timer in presence of an input and maintain relay status, turn the relay on or turn it off. Reset maintains the timer at its initial state as long as input is present, the timer will start counting up or down when the input is removed. In Pulse reset mode, it will reset and immediately restart the timer. In the third Reset variation, it will reset the timer & wait for a start pulse to begin counting again. A single LED displays the time counted up or down, 5 additional LEDs indicate hours, minutes, seconds, timer status and relay status. 1 set point can be programmed by the operator via membrane keys on the front of the unit. It is accurate to 0.01% of a quartz crystal. RCT707 features one relay with 4 relay functions: ON-DELAY, OFF-DELAY, CYCLIC-1 & CYCLIC-2. RCT404, a preset counter that counts events, batches, measures frequency, motor-speed, cable-length, acts as a zero-speed switch to detect stoppage of a rotating shaft and more. It features a 4-digit push wheel switch for frequent set point changesThe counter receives input from proximity switches, photoelectric switches, voltage pulses, limit switches, micro switches and electromagnetic pickups amongst others. The counter measures frequency up to 5000 Hz. RCT404 features a single LED display, which indicates the measured process value. 2 additional LEDs indicate the status of each of the 2 relays. Operators view and change up to 2 set points on the display via the push wheel on the front of the unit. The counter counts a range of 0 to 999999 with absolute accuracy & measures 0.06 - 9999 RPM within 0.05% of the reading. RCT404 features 2 user-programmable electromagnetic relays for process control as well as retransmits an isolated output signal to other devices such as a Programmable Logic Controller (PLC) or Solid-State Relay (SSR). RCT404 provides mutual signal isolation of 1kV AC RMS/1 minute for its own power supply, the input and output. RCT301 is a preset counter that counts events, measures frequency, batches, motor-speed, cable-length, acts as a zero-speed switch to detect stoppage of a rotating shaft and more. 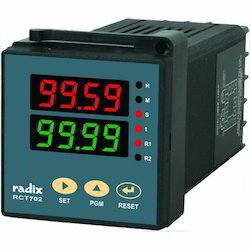 RCT301 features a dual LED display; the upper display indicates for the counter and the lower display indicates rate, batch, totalizer-value or a set point as selected by the operator. 8 additional LEDs indicate set point and relay status, communication status and whether the batch or total value is displayed. The operator can set up to 2 set points for the process value. The counter counts a range of 0 to 999999 with absolute accuracy & measures 0.06 - 9999 RPM within 0.05% of the reading. RCT301 features 2 user-programmable electromagnetic relays for process control as well as retransmits an isolated output signal to other devices such as a Programmable Logic Controller (PLC) or Solid-State Relay (SSR). RCT301 provides mutual signal isolation of 1 kV AC RMS/1 minute for its own power supply, the input and output. RCT403, a preset counter that counts events, batches, measures frequency, motor-speed, cable-length, acts as a zero-speed switch to detect stoppage of a rotating shaft & more. It features a 6-digit push wheel switch for frequent set point changes.The counter receives input from proximity switches, photoelectric switches, voltage pulses, limit switches, micro switches and electromagnetic pickups amongst others. It can count up, count down, bidirectionally as well as in quadrature. The counter measures frequency up to 5000 Hz. 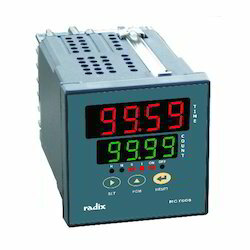 RCT403 features a single LED display, which indicates the measured process value. 2 additional LEDs indicate the status of each of the 2 relays. Operators view and change the single set point on the display via the push wheel on the front of the unit. RCT403 features 2 user-programmable electromagnetic relays for process control as well as retransmits an isolated output signal to other devices such as a Programmable Logic Controller (PLC) or Solid-State Relay (SSR). RCT403 provides mutual signal isolation of 1kV AC RMS/1 minute for its own power supply, the input and output. 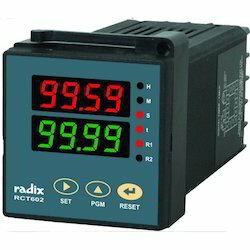 RCT203 is a programmable counter and RPM indicator used to counts events, measures frequency, motor-speed, and cable length as well as measure motor and shaft speeds up to 5000 Hz. The counter receives input from photoelectric switches, proximity switches, voltage pulses, limit switches, micro switches and electromagnetic pickups amongst others. RCT203 features a single 6-digit programmable LED display, which indicates the measured process value or calculated totaliszed value. As a counter, RCT203 counts between 0 & 999999 with absolute accuracy. For rate-indication, it can measure 0.06 - 300000 RPM within 0.05% of the reading. For even greater accuracy, RCT203 can be programmed to take in multiple pulse-inputs over 1 rotation and display the correct value via a scaling calculation. 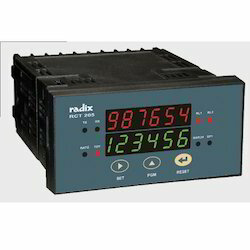 RCT202 is a programmable RPM indicator typically used to measure motor and shaft speeds up to 5000 Hz. The rate-indicator receives input from proximity switches, photoelectric switches, voltage pulses, limit switches, electromagnetic pickups amongst others. 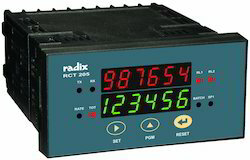 RCT202 features a single 4-digit programmable LED display, which indicates the measured process value. The rate-indicator can measure 0.06 - 9999 RPM within 0.05% of the reading. .
For even greater accuracy, RCT202 can be programmed to take in me ultiple pulse-inputs over 1 rotation & display the correct value via a scaling calculation. 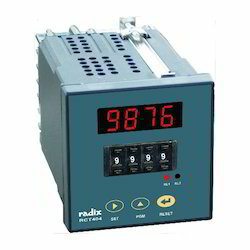 RCT708 is a multifunction Timer with Volatile Memory programmable timer to automatically operate a time-based process, counting upwards or downwards. It has volatile memory and will not store information without a power supply. 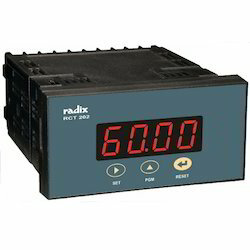 The timer features a wide range of configurable control inputs. Start simply turns on the timer and there are 3 variations each for the Stop, Reset and Gate control input functions. The Stop function can stop the timer and maintain relay status, turn the relay on or turn it off. Similarly, Gate will freeze the timer in presence of an input and maintain relay status, turn the relay on or turn it off. Reset maintains the timer at its initial state as long as input is present, the timer will start counting up or down when the input is removed. In Pulse reset mode, it will reset and immediately restart the timer. In the third Reset variation, it will reset the timer and wait for a start pulse to begin counting again. A single LED displays the time counted up or down, 5 additional LEDs indicate hours, minutes, seconds, timer status and relay status. 2 set points can be programmed by the operator via membrane keys on the front of the unit.RCT708 features 2 relays with 4 relay functions: ON-DELAY, OFF-DELAY, CYCLIC-1 and CYCLIC-2. RCT205 is a Preset Counter that counts events, batches, measures frequency, motor-speed, cable-length, acts as a zero-speed switch to detect stoppage of a rotating shaft and more. It can count up, count down, bidirectionally as well as in quadrature. The counter measures frequency up to 5000 Hz. RCT205 features a dual LED display; the upper display indicates for the counter and the lower display indicates rate, batch, totalizer-value or a set point as selected by the operator. The operator can set up to 2 set points for the process value. 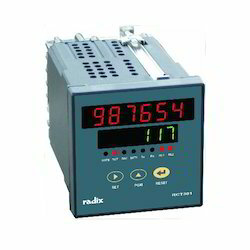 The counter counts a range of 0 to 999999 with absolute accuracy and measures 0.06 - 9999 RPM within 0.05% of the reading. RCT205 features 2 user-programmable electromagnetic relays for process control as well as retransmits an isolated output signal to other devices such as a Programmable Logic Controller (PLC) / Solid-State Relay (SSR). RCT205 provides mutual signal isolation of 1 kV AC RMS/1 minute for its own power supply, the input and output. RCT203 accepts input from proximity switches, photoelectric switches, voltage pulses, limit switches, electromagnetic pickups amongst others. 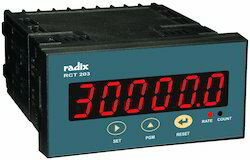 RCT203 features a single 6-digit programmable LED display, which indicates the measured process value or calculated totalized value. As a counter, RCT203 counts between 0 and 999999 with absolute accuracy. For rate-indication, it can measure 0.06 - 300000 RPM within 0.05% of the reading. RCT205 is a preset counter that counts events, batches, measures frequency, motor-speed, cable-length, acts as a zero-speed switch to detect stoppage of a rotating shaft and more. The counter receives input from proximity switches, photoelectric switches, voltage pulses, limit switches, microswitches and electromagnetic pickups amongst others. It can count up, count down, bidirectionally as well as in quadrature. The counter measures frequency up to 5000 Hz. RCT205 features a dual LED display; the upper display indicates for the counter and the lower display indicates rate, batch, totalizer-value or a setpoint as selected by the operator. 8 additional LEDs indicate setpoint and relay status, communication status and whether the batch or total value is displayed. The operator can set up to 2 setpoints for the process value. The counter counts a range of 0 to 999999 with absolute accuracy and measures 0.06 - 9999 RPM within 0.05% of the reading. RCT205 features 2 user-programmable electromagnetic relays for process control as well as retransmits an isolated output signal to other devices such as a Programmable Logic Controller (PLC) or Solid-State Relay (SSR). Signal isolation protects your devices and machines downstream of our instruments from damaging fluctuations in the input signal. RCT205 provides mutual signal isolation of 1 kV AC RMS/1 minute for its own power supply, the input and output. The rate-indicator receives input from proximity switches, voltage pulses, photoelectric switches, limit switches, electromagnetic pickups amongst others. 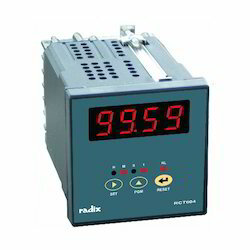 The rate-indicator can measure 0.06 - 9999 RPM within 0.05% of the reading. For even greater accuracy, RCT202 can be programmed to take in multiple pulse-inputs over 1 rotation and display the correct value via a scaling calculation. Application: RPH, RPM, RPS, Meters/Minute, Mains Frequency, etc. RCT301 is a preset counter housed in a heavy-duty enclosure certified flameproof for gas groups I, IIA & IIB with IP65 rating - completely dust proof and a good level of protection against wate. RCT301 counts events, batches, measures frequency, motor-speed, cable-length, acts as a zero-speed switch to detect stoppage of a rotating shaft and more. The counter receives input from proximity switches, photoelectric switches, voltage pulses, limit switches, microswitches and electromagnetic pickups amongst others. FRCT301 features a dual LED display; the upper display indicates for the counter and the lower display indicates rate, batch, totalizer-value or a setpoint as selected by the operator. 8 additional LEDs indicate setpoint and relay status, communication status and whether the batch or total value is displayed. The operator can set up to 2 setpoints for the process value. The counter counts a range of 0 to 999999 with absolute accuracy and measures 0.06 - 9999 RPM within 0.05% of the reading. FRCT301 features 2 user-programmable electromagnetic relays for process control as well as retransmits an isolated output signal to other devices such as a Programmable Logic Controller (PLC) or Solid-State Relay (SSR). FRCT301 provides mutual signal isolation of 1 kV AC RMS/1 minute for its own power supply, the input and output. 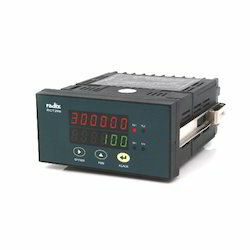 Looking for Multifunction Timer, Counters and Rate Indicators ?